The Giro Scamp is one of those helmets you see everywhere: on the neighbor kid who likes to cruise by on his Strider, discarded lazily aside a bike at the pump track, perched on the head of a little tot riding on the back of mom’s Xtracycle. Why is the Giro Scamp so popular for young kids? Because it is comfortable, safe, and it fits tiny heads exceptionally well. For years, I’ve been recommending the Giro Scamp to other parents. 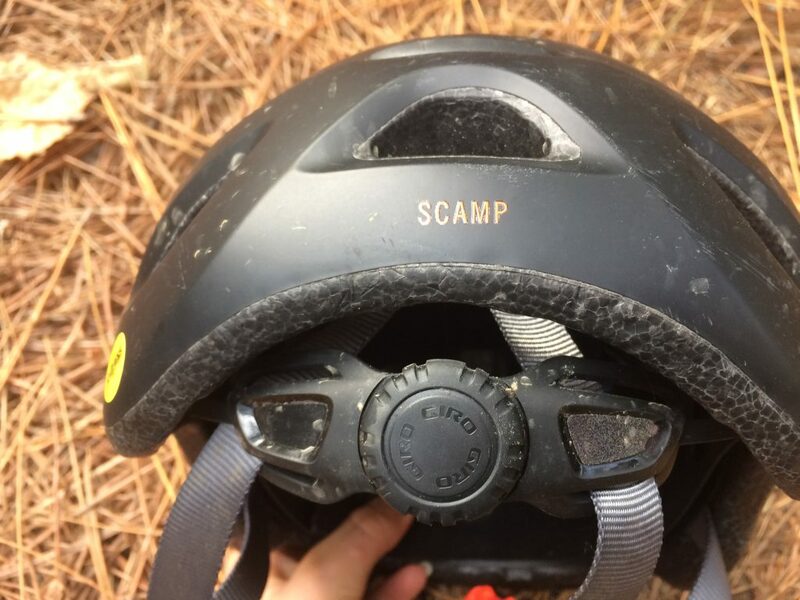 All our friend’s kids have the Scamp, half the kids we run into the local bike park have the Scamp, and yet we’ve never actually done a detailed review of the helmet. Fortunately, that’s about to change. Read on….. The #1 reason that parents buy the Scamp is that it is TINY. The XS helmet easily fits kids as young as 12 months old. Of course, you should first measure your child’s head to determine their head circumference, but even then I’ve found that the helmet fits heads slightly smaller than the Giro sizing chart would indicate (45-49cm). 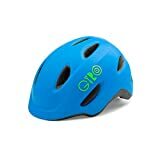 For parents of young toddlers, the Giro Scamp is one of the nicest helmets in this size range and easily beats out most of the cheaper helmets on the market. The size Small helmet is advertised as fitting heads sized 49 to 53 cm. 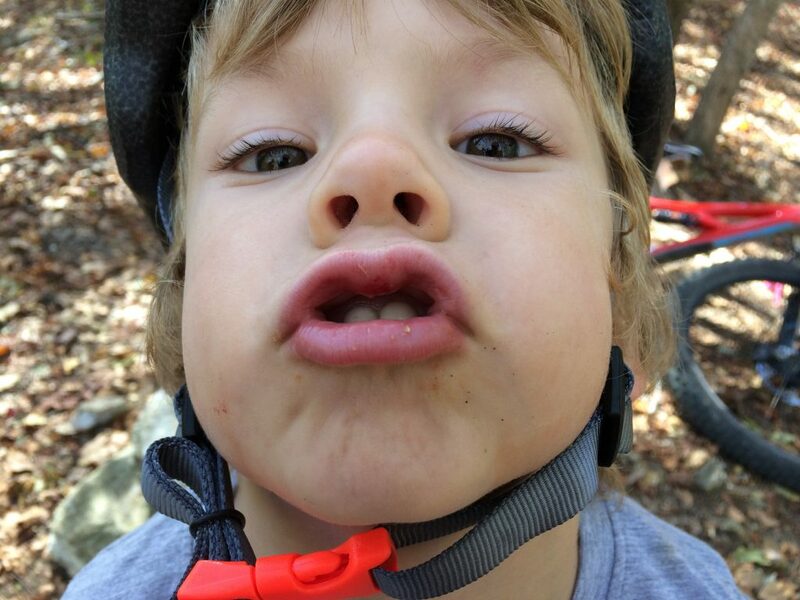 That said, my just-turned-5-year-old son has a head circumference of 50cm and the Giro Scamp fits but just BARELY. He would be better suited to a helmet like the Giro Raze. For this reason, I recommend the Giro Scamp for younger toddlers and pre-schoolers. 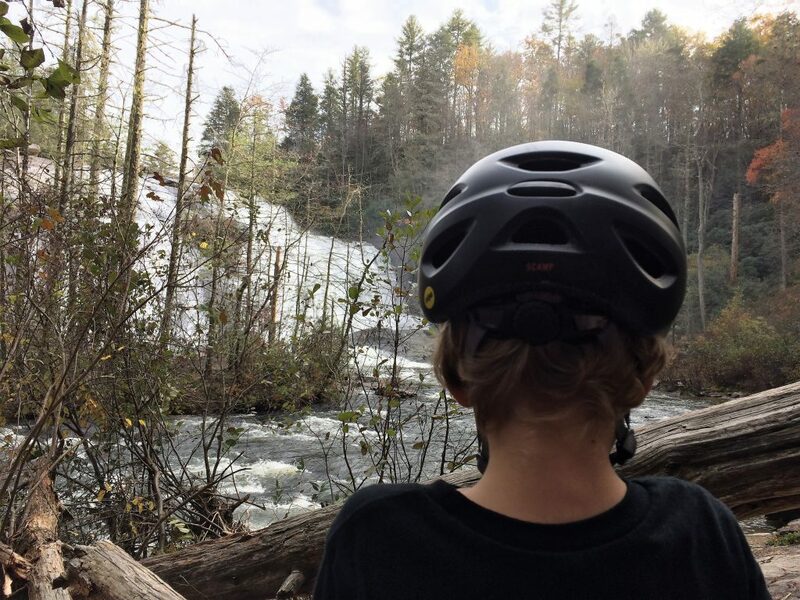 For more information on how to measure your child’s head and choose the appropriately sized helmet, read our post on how to fit a kids bike helmet. What is MIPS? MIPS stands for “multi-directional impact protection system.” It is essentially a two-layer helmet protection system in which the interior layer is a low-friction liner that rests on the rider’s head and results in less force transferred to the brain in the event of impact. The technology is still somewhat controversial, but we personally like the err on the side of extra safety when it comes to our son’s noggin. 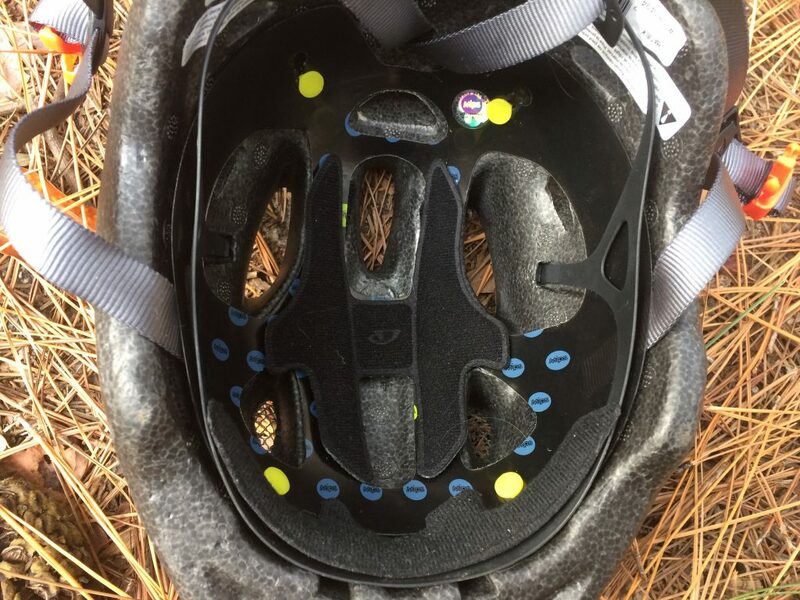 To learn more, read our article about MIPS in kids helmets. The nice thing about the Giro Scamp is that it is offered in both MIPS and non-MIPS versions. This gives parents the option to make their own decision on the value of MIPS. For parents on a budget, the non-MIPS helmet offers the same great design sans MIPS technology. The Giro Scamp adjusts via the chin straps and a rear dial-adjust. We love the dial-adjusts on kids helmets as they help get the fit just right, and allow the helmet to grow as your child does. The one thing that I’m not crazy about on the Scamp is the chin straps and buckle. The buckle, while not a deal-breaker, is the old-school style buckle that easily catches neck skin – ouch! We much prefer the magnetic buckles, but again this isn’t a deal-breaker. The thing that really gets me is the fact that the chin strips are very difficult to keep properly tightened. I am constantly running after my son re-tightening the straps, which is very challenging to do with an active pre-schooler! 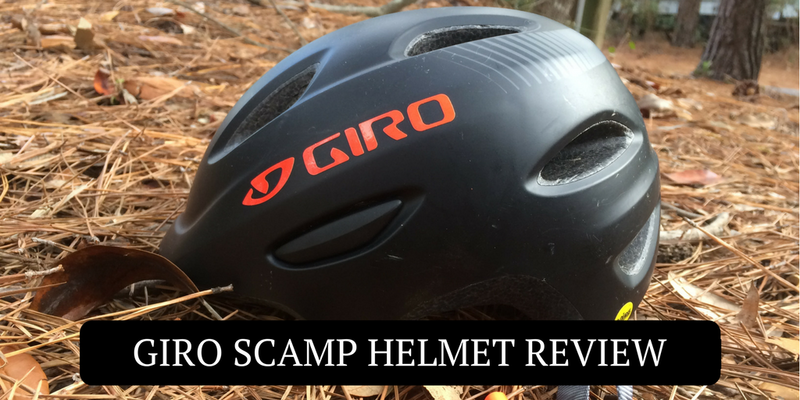 The shell of the Giro Scamp is similar to that of an adult mountain bike helmet. It has an integrated visor which is nice to help protect little eyes from the sun and shade their faces. The rear of the helmet provides plenty of back of the head coverage, which we love. The profile is also flat enough that the helmet works well in a trailer or bike seat where the child is laying the back of their head on the seat. Want to know how the Giro Scamp stacks up against other toddler helmets? As you’ll see in the comparison chart below, the Giro Scamp is one of the only helmets available with MIPS technology. It also happens to be the lightest helmet of the bunch which is particularly important for young heads and necks. The only rear drawback, is the lack of a magnetic buckle and pinch-free protection. You might also be interested in our article: 5 Best Bike Helmets for Toddlers. For parents with very young toddlers, the Giro Scamp is a clear winner in terms of safety, fit, and comfort. The ability to choose between MIPS and non-MIPS versions provides choice in terms of safety technology and ensures that the helmet is affordable for all. This is a helmet we will continue to recommend to parents of toddlers without reservation.